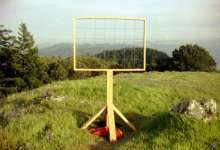 Shot on Mount Tamalpais, a spatial matrix replaces temporal causality with contiguous space. A view of landscape is taken apart, to be reconstituted through memory. The grid, a reference to the “veil of threads” invented by Albrecht Dürer as an aid for perspective drawing--to transfer vision to a sheet of paper--is used for an opposite effect--to disperse a landscape across time. The viewer is asked to remember the space as it passes and reconstitute it from memory, actively connecting the image across space and time.